Was home Friday, had a thing I couldn’t schedule on the weekend, an errand at village hall, and other chores. Originally had a vet appointment for Riley, but pushed it to tomorrow, as I didn’t want to mess with fresh snow and traffic snarls while trying to transport him (he gets spectacularly carsick). He had a scary problem earlier this week, vet thinks he has GERD so now I get to give him the kitty dose of Pepcid AC in addition to the other stuff. He’s maintaining weight, though. 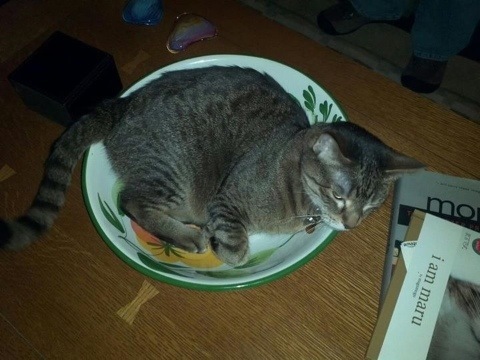 And last night he entertained us with his Bowl o’ Cat trick. I was laughing too hard to take a picture, so my husband David took it. Riley is to bowls as Maru is to boxes, apparently. Anyway: SNOW, we finally has it! It’s finally looking like winter in the Midwest as the season’s first big snowstorm crawls across the region, leaving skiers and snow-reliant businesses giddy but greeting morning commuters Friday with a sloppy, slippery drive. After starting as one of the warmest and brownest winters in recent history, parts of Wisconsin, Iowa and Missouri were blanketed in white before the storm moved into Illinois and Michigan. Snowplow drivers were out in force overnight in Chicago, as six to eight inches of snow and plummeting temperatures moved in. This entry was posted in Home Truths, The Life of Riley and tagged Snow by ginny. Bookmark the permalink.